Only fifty games into his professional career, Memphis’ Hasheem Thabeet is finally going to get his chance to prove he is an NBA player . . . in the NBA’s Developmental League. After struggling to find playing time in coach Lionel Hollins front-court behind All-Star Zach Randolph, Marc Gasol, and Hamed Haddadi, the Grizzlies sent the former Co-Big East Conference Player of the Year to their D-League affiliate, the Dakota Wizards. Thabeet averaged a paltry 2.5 points and 2.9 rebounds, to go along with 1.2 blocks per game in only 10 minutes/gm this season. The 7-foot-3 shot blocking specialist from the University of Connecticut becomes the highest draft pick (#2 in ’09) to be assigned to the D-League. Martell Webster of the Portland Trailblazers, who was drafted #6 in ’06, was the previous highest pick sent down to the NBA’s version of baseball’s minor leagues. He may have a shot of returning to the Grizzlies in quick order since the Dakota Wizards play a frantic schedule, which includes seven games over thirteen days before having a week off. At that point, if Hasheem has shown signs of improvement, he may once again be on the NBA roster for the remainder of the Grizzlies season. Hopefully the former college star who averaged more than four blocks per game for his career for UConn will be able to develop a little more potent offense to go with his already imposing defensive presence. At Connecticut, he was relied upon to be a defensive stopper, while other players like Jerome Dyson, AJ Price, and Jeff Adrien provided the offense. Undoubtedly the Grizzlies hoped that Thabeet could become one of the premiere defensive big men for the next decade, since he sought out and received help last summer from NBA Hall of Famer Hakeem Olajuwon on his offensive moves. In his two games with the Wizards in the NBDL, Thabeet has been both good and bad. In his first game, he put up less than stellar numbers like 8 points, 2 rebounds, and 4 fouls in only 18 minutes, while in his second game, he showed much of what the Grizzlies were hoping to get in 19 points, 16 rebounds, and 6 blocked shots in 38 minutes. The jury is still out on Thabeet, but this is a good thing seeing as how he is only a few years removed from playing soccer in his native Tanzania in Africa. A bit more seasoning through more playing time against lesser competition should help the young, but raw shot blocker develop into a better rounded professional who could be a mainstay of some NBA team’s front-line for many years to come. After all, the D-League has been beneficial to a number of current NBA players like Shannon Brown, Rafer Alston, and Chris “Birdman” Andersen. 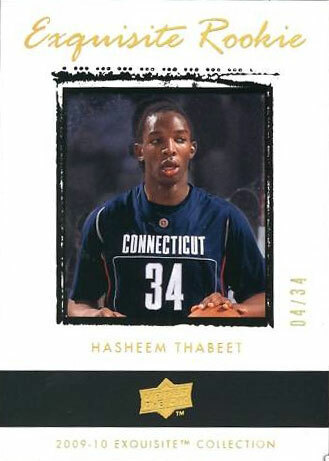 So will we see Hasheem Thabeet on an NBA roster next season, or will he go down as one of the league’s biggest draft busts? Allen Moll is an avid NBA and College Basketball fan who watches and studies games religiously. He also coaches youth basketball in his native Lehigh Valley region of Pennsylvania. Allen is a regular columnist for thehoopdoctors.com, Bleacherreport.com, UpperDeckBlog.com, and his own blog, Hoops Haven (thehoopshaven.com). No doubt Hasheem Thabeet will be on the Grizzlies roster next season, as they still owe him ~$4.8 Mil next season, although I wouldn’t be surprised if they declined his option in the ’11 off-season. I’d actually be surprised if they picked it up. I think he’ll eventually develop into a serviceable big in the L, mainly on the defensive end, but don’t see him turning into anything major ala Deke or Zo. Just gotta give him some time. I think it would have been more beneficial to his game to stick around at UCONN for his senior year, but with his stock being so high, you can’t really blame him for leaving. He’s hasn’t even been playing the game for a decade, so of course he is raw. But he did improve quite a bit during his 3-year span in college.